Barry Lewin took over this series a few years back, and is doing an awesome job with it! I have been staying at Graeme Soloman’s place on the water here in Cape Town. It’s been so awesome to be able to just hop straight in my K1 and train, right from the front lawn! Thanks for having me Solly! I am glad to be one of the many “champions” who have stayed and trained from his base 🙂 Hanging with Megs and him and has been so awesome, and it has been such a help. Megan has a very interesting vet practice, called Holistic Vet, where she specialises in animal reahabilitation. I came down to Cape Town, as I had the privilege of being the Guest Speaker at Somerset House School. I got to present their Sports Awards. The Headmaster there, Chris Storey, was my first canoeing coach, and after setting up the every successful canoeing program at Bridgehouse School, he moved to Somerset House about 4 years ago. It was great, and I hope I inspired some future Olympians! I am here for the week, and am hoping to get in some quality training, and race practice. 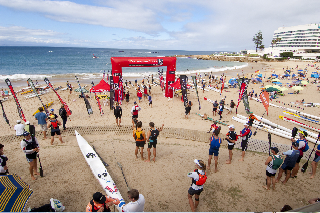 On Sunday I raced the Discovery Sunglass Hut Series race at Oceana. It was an out and back course. Out into a strong wind and swell, but then turning and enjoying the downwind on the way back. After a terrible start, I managed to haul in first place, Nikki Mocke. After sitting with her and Billy and Tracy Harker (mixed doubles winners) I put in a surge to try to catch the bunch ahead of us. In the process I dropped her and the Harkers. I turned in first, and then managed to open up my lead on the downwind section, to win by over 3 minutes. I am training here for the next week, and race the Peninsular Marathon on this coming weekend, before flying to Dubai to defend my title there. It’s always great to be in Cape Town, catch up with old friends and just enjoy the beauty of it! Thanks to John for the awesome images. Click on them to go to his website. After reading Rob’s pre-Dubai race report, I thought I would add to his one liner about the female race with my own little splurb… (budding journalist that I am). No doubt there should be a great men’s race, with lots of surf ski hotties showing up. In the women, Rob mentioned that Katie Pocock from New Zealand is coming. Despite winning the race in 2007 and placing 3rd in 2009, she is unfortunately not going to make it. Nikki Mocke will be there in her first attempt at the race. 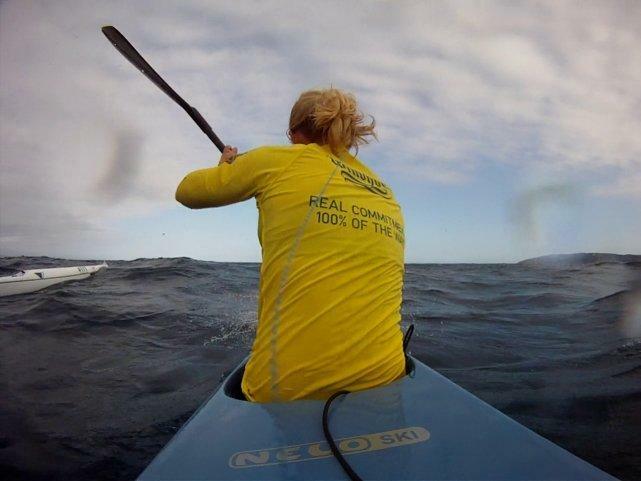 She missed the last few due to her commitments to the South African K4 that went all the way to the Olympics, quite a feat that she, as a surf ski paddler could convert her skill to flatwater sprinting. 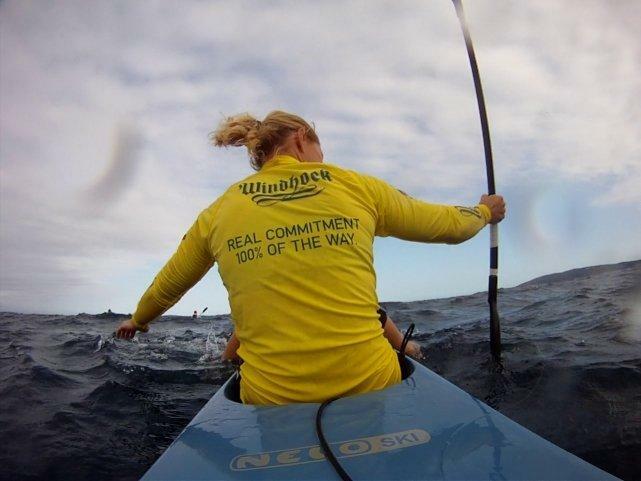 No offence to her husband, but to illustrate how difficult this is, Dawid tried to make it in flatwater, and had to resign himself to the fact that he is an amazing ski paddler, but not very fast on the flats! Nikki has made no bones about the fact that she is back, and has won the Durban World Cup since her return as well as dominating the Cape Discovery Sunglass Hut Surf Ski Series. Ruth Highman from Australia, who was 2nd at the Dragon Run last year, and who also got 2nd at the recent Island Shamaal, will be making her first attempt at the Dubai Shamaal. The Perth-based doctor is known to be better in the downwind conditions. Michele Eray has won the past 2 Dubai Shamaal’s, and is probably the only paddler who crosses all areas of the sport of paddling by competing in flatwater, both Sprints and Marathon, as well as River racing. The Olympian has had a agreat year, winning the Fish River Marathon last month, as well as placing 4th, just a few meters off a medal at the World Marathon Champs in Spain. Only Hank McGregor out of the men, also crosses over to other types of paddling sports with success. Locally, Christie O’Higgins will be the favourite, and she gets to train on that part of the water as often as she likes. Chloe Bunnet, originally from Knysna, South Africa, who know lives in the UK, will be there. 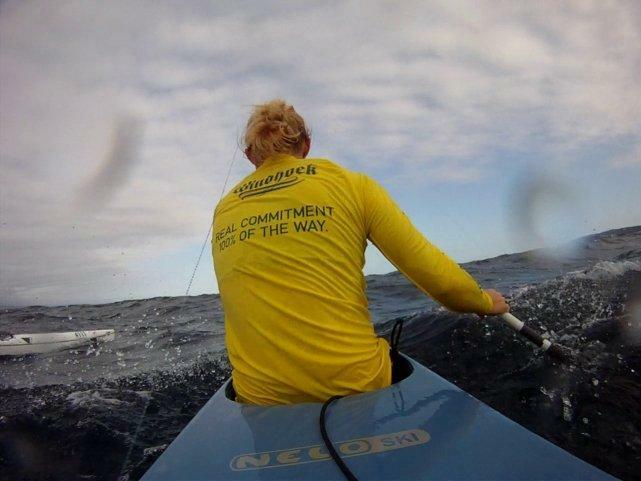 She recently won the British Champs, and is thoroughly enjoying her new-found sport, having crossed over from Flatwater. No one else has entered, neither have I actually! I better get on it. But anyway, I just thought I better write something because no one else is going to! Seriously though, the general disregard towards the women paddlers and lack of support really does get me down. How do we change this? It has been mentioned that the Dubai Shamaal organizers put on big cash for the race in 2008 and not many people showed, well when they dropped the money the next year, even less showed. Why do none of the women come back (except for idiot me)? Well firstly, it won’t happen over night. The Nelo Summer Challenge had a great idea this year. They made 1st to 3rd equal in the men’s and womans prizes, then the women’s stopped, and the men’s carried on to 10th. This did not ignore the fact that the women that were there were top class/world champions, but it did acknowledge that there were more men than women. They rewarded the talent and not the depth! Go Europe! Is it just Africa that is still in the dark ages? The National bodies (canoeing etc) and race organisers, and boat manufacturers should be the ones who are attempting to grow the women’s side of the sport. Canoeing South Africa were very quick to implement a “Development program” to help all the previously disadvantaged people (Males) out there. And it paid off with Michael Mbanjwe being the first male black Dusi winner when he won the K2 with Martin Dreyer in 2007. Now take this into consideration: women were only allowed to paddle the Dusi for the FIRST time in 1981, and it was in a K2 with a MALE. I don’t even know when they were first allowed to paddle on their own! That is a full 30 years after the first male paddled down the river. Should women not considered “development” paddlers then? Surely Canoeing South Africa should then also be doing something to help the situation then? We have a long way to catch up. 30 years worth… Lucky we learn quick! Physically we will never beat the top men (well unless there is something seriously wrong!). I must say though, that I have experienced men who will rather die then get beaten by me. Is that the problem? Is this all an ego issue? Personally, all these guys that paddle in tights is a bit scary. OK, that is enough banter. I am going to paddle, in my ski, with a bikini on! And yes, I am going to paddle further than the local guys, and train harder, just because I can. And I will squeal when I go down the first run, like a GIRL! So there are 70 ski’s out there! Hectic. Peter Ekstrom gives you a run by of them all.